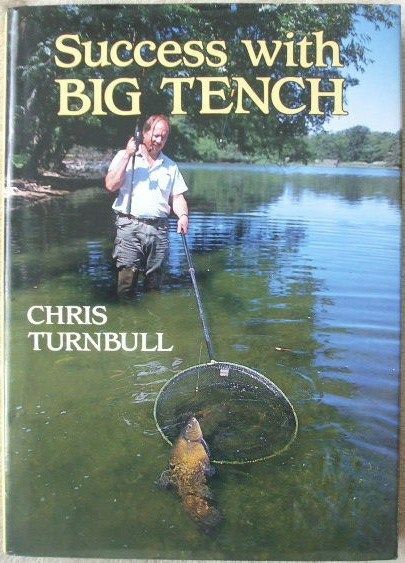 First edition, first print hardback of SUCCESS WITH BIG TENCH by Chris Turnbull and published by David & Charles in 1992. Line drawings by Chris Turnbull. The book is in very good condition (Clean green cloth boards with gilt lettering on spine), with minor wear to the pictorial dust jacket which is not price clipped (light creasing to the edges, a one centimeter closed tear to the bottom edge at the back). There is a small stain on the front page ends. Internally, the pages are clean and tight and there are no tears and no inscriptions. Chris Turnbull is an all-round big-fish angler, who has specialised in summer tench-fishing since childhood. He has captured many large specimens of over 7lb from five different waters, including three huge 9lb tench. He is well known as one of the country's leading artists, and his work can be seen in many books and articles. As a writer he has contributed to various angling magazines over the years and has also written contributions to various books and he has also produced four well-received books 'Big Fish From Famous Waters' (1990), ‘Success With Big Tench’ (1992) and ‘Time For Tench’ (2004). His latest book, entitled ‘Reflections: Highlights from An Angling Life’ was published in May 2011. In Success with Big Tench, the contributions from other anglers include: Len Arbery, Mike Davidson, Steve Harper, Tony Miles, Roger Harker and Barry Snape. "As the favourite summer species of many big fish specialist anglers, tench offer some of the most interesting and challenging fishing available. In response to many environmental changes, tench have in recent years achieved enormous growth potential - and they are getting bigger all the time! Records are constantly being broken as more and more enormous specimens are landed from a widening range of waters. Many anglers are making the most of these exciting new prospects, and are turning their attention to the frequently difficult waters that this tough, hard-fighting species prefers. If the angler has any chance of achieving regular success, he must study tench behaviour thoroughly, and master a practical knowledge of a wide variety of angling skills. New ideas, methods and approaches are constantly being developed to cope with the demands of each of these waters. Chris Turnbull, along with a number of highly respected names in the world of tench-fishing, here takes a thorough look at traditional methods of catching tench, and goes on to examine the revolutionary advances in tackle and techniques that have led to some staggering catches in recent years. Illustrated thoroughout with excellent and informative line illustrations and photographs, this innovative book is a must for every coarse angler's bookshelf." 168 pages. Illustrated with black & white and colour photographs and line drawings within the text.